Astronaut Nicole Stott, STS-128 mission specialist, attired in a training version of her Extravehicular Mobility Unit (EMU) spacesuit, is pictured during a spacewalk training session in the waters of the Neutral Buoyancy Laboratory (NBL) near NASA's Johnson Space Center. Two astronautswill venture outside the International Space Station Tuesday to kick off theirmission?s first spacewalk while their crewmates inside begin unpacking the tonsof cargo delivered by the shuttle Discovery. 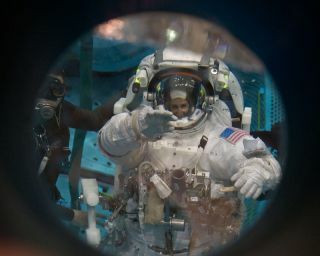 Discoveryastronaut Danny Olivas and station crewmember Nicole Stott plan to don theirNASA-issue spacesuits and float outside at 5:49 p.m. EDT (2149 GMT) to begin a 61/2-hour maintenance call on the orbiting laboratory. Their main chore willbe the removal of an old, enormous ammonia coolant tank. The ammoniatank weighs about 1,800 pounds (816 kg). While it will float in microgravitywhen removed, it will still carry the same mass as a small compact car so Stottand Olivas will have to be careful, said Zeb Scoville, lead spacewalk officerfor Discovery?smission. ?It?s apretty complex task in terms of mass handling,? said Scoville. The oldtank is nearly empty and will be replaced with a new one to help keep the spacestation?s systems cool. It will take two spacewalks to make the swap, with thesecond one scheduled for Thursday. Astronauts must also take care to avoidcontamination from toxic ammonia while working with the tank, mission managerssaid. Stott andOlivas will also retrieve a suitcase-like material exposure experiment and aEuropean experiment from the end of the station?s Columbus laboratory. Tuesday?sspacewalk will mark the first for Stott and the third for Olivas, who isleading all three of the spacewalks planned for Discovery?s 13-day resupplymission to the space station. The two astronauts camped out in the station?sairlock early Tuesday to purge their bodies of nitrogen in a protective measureto avoid developing the bends during their spacewalk. ?I think it?sgoing to be really exciting,? said Stott, who joined the station crew Sundayafter arriving aboard Discovery. WhileOlivas and Stott work outside the station, the11 astronauts inside the outpost will begin unloading the nearly 8 tons of freshsupplies and science gear from a cargo pod delivered by Discovery?s crew lateMonday. One of thetop items on Tuesday?s move-in list is a treadmill named after TVcomedian Stephen Colbert, who won the naming rights for a new space stationroom in an online NASA poll earlier this year, but got the exercise gearinstead. NASA dubbedthe treadmill the Combined Operational Load Bearing External ResistanceTreadmill, or COLBERT, as a consolation prize after naming the new spacestation room Tranquility in honor of the Apollo 11 moon base. The $5 million COLBERTtreadmill launched to the station in amyriad of pieces to be assembled in space. ?It?s inmany, many pieces,? space station flight director Ron Spencer told reporterslate Monday. ?I?m not sure when we plan on putting it together.? Thetreadmill components are packed in several bags that will be stored aboard thespace station until mid-September, after Discovery leaves and a new unmannedJapanese cargo ship arrives. Only then, mission managers said, will astronautshave time for the 20 hours or so it will take to build the COLBERT treadmill. Astronautswill also move an air-scrubbing device, storage bin and new astronaut bedroomthe size of a large refrigerator into the space station on Tuesday. ?The crewis going to be quite busy, even after [this] mission is over, for the next fewweeks,? Spencer said of the station astronauts.